← Toronto After Dark 2009 Submission Deadline Friday! Inside Hana’s Suitcase (Director: Larry Weinstein): Inside Hana’s Suitcase is beautifully crafted and easily one of the best films at Hot Docs this year. It’s based upon the the internationally acclaimed book “Hana’s Suitcase” written by Karen Levine. It’s a holocaust story but don’t let that fool you into thinking it will be another depressing doc. 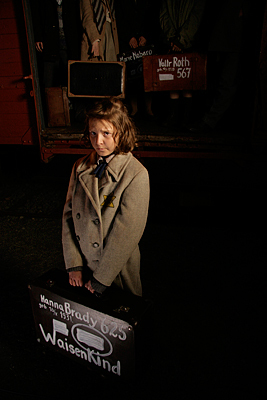 Through a series of dramatic re-enactments the film tells the real-life story of two Jewish children from Czechoslovakia, George and Hana Brady. Things shift from the 1930s and 1940s world of Czechoslovakia to present-day Japan at the Tokyo Holocaust Museum. A suitcase with the name Hana Brady painted on it is delivered to the museum where Fumiko Ishioka and her students discover that it came from Auschwitz. They examine the contents of the suitcase and learn as much as they can about Hana’s life and the war. Their journey leads to the discovery that Hana’s brother George is alive and living in Toronto. From there the story continues to get more and more interesting. Throughout the film, children from around the world tell Hana’s story and the lessons they’ve learned from her experience. I thought this was pure genius because it provides the audience with a child’s perspective of the war in a way that is powerful and full of hope. Larry Weinstein’s direction is brilliant and puts the film in the same league as last year’s Academy Award-winning film, Man On Wire. The period music and special effects transport the viewer back to the war while animation of Hana’s drawings enrich the moviegoing experience. Inside Hana’s Suitcase is a film about hope that children and adults can learn from and enjoy on many different levels. I highly recommend this film and hope it gets a theatrical release. Update: Inside Hana’s Suitcase was named as one of the top ten audience favourites at Hot Docs this year. This entry was posted in Documentaries, Film Festivals, Hot Docs and tagged #hotdocs09, holocaust, worldwar2. Bookmark the permalink. Alan, since this is a new release, I don’t have any information about a DVD release if that’s what you’re after. You can get in touch with the production company (Rhombus Media) by emailing infoATrhombusmediaDOTcom (symbols spelled out to stop email spam harvesters). Hope that helps! The film will receive a limited release in Toronto beginning Friday November 6th. It’s also opening in Vancouver November 13 at Festival Cinemas. I was wondering if the movie had been put out yet. Is it to be put out? please answer. I know that george brady is alive today living in toronto. who was hana’s entire family? please email me back. Thank you.